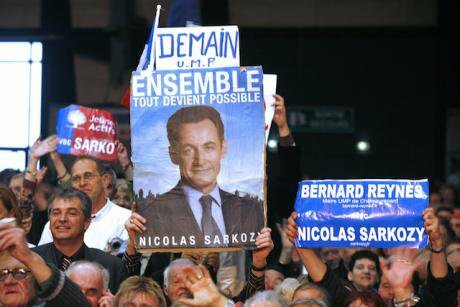 Supporters listening to Nicolas Sarkozy, UMP candidate for the presidential elections during his last campaign meeting on May 3, 2007 in Montpellier, France. ABACA/ Press Association. All rights reserved.National electorates have lost their primacy in deciding the outcome of their elections. They have the vote and they go to the polling booths, but their choice may be determined by a foreign government or a private company. In the new information order, manipulated voters have come to outnumber threatened voters and bribed voters. Democracy has spawned manufacturers of dissent and consent who can be contracted for swaying the election results in one country or organising a political 'Spring' and destabilising a regime in another. If it is illegal to subvert free elections in another country, the official intelligence agency can outsource the job to private commercial players. This formula for plausible deniability has been tried and tested. Democracy has spawned manufacturers of dissent and consent who can be contracted for swaying the election results in one country or organising a political ‘Spring’ and destabilising a regime in another. Data mining is as important a weapon in the arsenal of a political leader as it is for a company selling soap and shampoo. This indictment was used by the US national security adviser H R McMaster to say that “Russian meddling is incontrovertible and beyond dispute”. Trump denies the allegation and blames the FBI for investigating his election campaign. Trump denies the allegation and blames the FBI for investigating his election campaign. According to media reports, the Cambridge Analytica executives boasted of their role in getting Trump elected. Their weapon was “unattributable and untrackable” advertising to support their clients in elections. The firm, according to a senior member of staff, was “behind” the “defeat crooked Hillary” advertising campaign. It just placed false information into the bloodstream of the internet and then watched it grow! The Observer reported that the company had unauthorised access to tens of millions of Facebook profiles which were used to build a political targeting system to help Trump. The British company faces allegations of the theft of personal data from American voters. The newspaper headlines appearing every week will not let the controversy die or let the Trump poll campaign get a clean chit soon. A report of foreign interference in national politics has been reported from another democracy – France. The former President Nicolas Sarkozy has been taken into police custody for questioning” over allegations that he received millions of euros in illegal election campaign funding from the late Libyan dictator Muammar Gaddafi. Sarkozy won that election in 2007. Sarkozy also faced another allegation of false accounting for his failed re-election campaign of 2012 when he was described as a “political showman” because of his expensive rallies and the US-style stadium gigs. The employment of foreign poll consultants by the candidates in emerging democracies has become a known strategy. The employment of foreign poll consultants by the candidates in emerging democracies has become a known strategy. In a new scenario, a foreign government can offer this expensive service to a favoured candidate in the Third World in a clandestine manner. It can evade the charge of meddling in a foreign election by enlisting the Diaspora favouring one candidate over the other, one ideology over the other in the motherland. A political revolution in Iran can be seeded in Brooklyn! This meddling is done in the name of promoting democracy in the target country. In some cases, the new regime turns out to be more oppressive and a transient political ‘Spring’ is followed by a harsher winter. A big power smells an opportunity if the Diaspora belongs to a politically polarised country. Depending on the foreign and economic policies of the target nation, official agencies recruit either the dissidents or the supporters of the regime from among the expatriates. A political revolution in Iran can be seeded in Brooklyn! This meddling is done in the name of promoting democracy in the target country. Social media is a very powerful political tool in possession of the Diaspora! Digital patriots have proliferated in recent years. The Diaspora helps its favourite leader’s campaign in the motherland through tweets and online campaign videos. It organises impressive events for a visiting leader from “home” and holds a token protest against his political opponents or his critics in the media. If a Third World leader cannot afford data mining, analysis and poll consultancy by a foreign firm, the Diaspora can foot the bill. Such remotely run campaigns influence the voters of the target country as the US Presidential election proved. The growing external influence on the democratic process is now understood by every smart elected leader. He knows that his people’s mandate for a given number of years is not enough and he fears destabilisation. He wants to strengthen his position by getting a big external power’s endorsement. It also enhances his popularity in his country, especially if it happens to be a former colony. The Third World leaders realise the importance of the President of the United States and seek a bargain with him. Abandoning their party’s election manifesto, they open up the domestic market a little more to become more acceptable to powerful nations. They carry orders for big-ticket military equipment when they go to meet their counterparts. A smart elected leader does not antagonise a big power for fear of ruination. His democratic credentials are not enough to keep him safely in power. They carry orders for big-ticket military equipment when they go to meet their counterparts. A vilified dictator who benefits the commercial and manufacturing interests of his host country is hailed as a world statesman. And the same dictator refusing to play ball at a later stage can be deported from the world. An old photograph of an American defence secretary bowing in the court of Saddam Hussein illustrates how an enemy was a great friend once. Another columnist Jeremy Fox calls the City of London “the prime launderette for dirty money and the world’s largest controller of offshore tax havens”. It became the prime destination for the super-rich Russians after the end of the cold war. Following the suspicious deaths of a former Russian spy who spied for Britain, some British columnists made dark references to the Russian oligarchs helping the ruling party in Britain. Some British media moguls have perfected the art of winning friends in a coming government by influencing the people during the election campaign. A media owner doesn’t just ask his editors to write the desired kind of opinion pieces and editorials but unleashes his trusted reporter on a leader whom he doesn’t want to become the next Prime Minister. At the behest of the government, the media moguls can deploy massive financial resources in publishing and distributing a book written by a foreigner fighting the leader of that country. Their Indian counterparts have quickly learnt from them. The Indian media scene has become so dismal that every now or then a TV or a newspaper journalist either resigns in protest or is thrown out for showing signs of independent thinking. This happened twice this month. The Indian media scene has become so dismal that every now or then a TV or a newspaper journalist either resigns in protest or is thrown out for showing signs of independent thinking. This happened twice this month. Such domestic threats to democracy have been discussed for years. But it is the external threat that has grown manifold and is set to acquire greater lethal power to disrupt a democracy. The new weapon is safer to use, and technological advances will make it more and more effective. It has demonstrated its capability not just in the young democracies but even in mature democracies. The new weapon is safer to use, and technological advances will make it more and more effective. Some powerful western democratic nations who preach democracy while supporting cruel but friendly foreign dictators, used to suppress the democratic movements in those countries by offering a dictator the best of weapon systems plus substantial financial aid, while keeping quiet about the human rights violation by his forces. Now, they can help a subservient dictator by using subtle methods to sabotage the electoral chances of his democratic opponent. Many democracies keep trying to curb the misuse of money and muscle power in elections. Now the spectre of the “foreign hand” has come to haunt the democratic process. Media coverage of external meddling in elections makes the true democrats anxious and gives added credibility to those forecasting the death of democracy.